The URL is the same, so no need to change any way that you follow me. And also as you see, the header of my blog didn't change, but just about everything else did! Check out the sidebar(s! ), my pages, and more for some fun new features! Just explore and find your way around. I hope that you love it as much as I do :) And be sure to follow me on google friend connect now that I've got it back! Anyways, to kick off my new blog and to thank you all who have been reading Wear Abouts (and who weathered the week long posting hiatus--it was hard for me too, guys, it was hard for me too), I am going to have a crazy wicked awesome WEEK OF GIVEAWAYS. Which means that yes, I will be posting a giveaway EVERY SINGLE DAY for the next 7 days! The giveaway winners will all be announced in one big celebratory post at the end! What will you win? 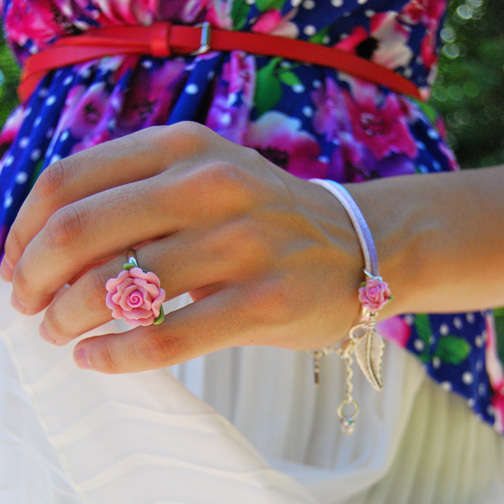 A ring and bracelet from the summer collection! I love my Abilu pieces...they're so original! Good luck everyone! As always, enter the Rafflecopter form below. p.s. You'll be seeing me in quite a bit of new Forever 21 pieces in the next few posts...I had a crazy online shopping spree where I bought $50 dollars worth of BOGO sale clothes...I got 8 things total (FOR 50 BUCKS)! :) I sure do love a good deal! Cute outfit! Love your shoes!!!!!!!! Omg you never cease to amaze me! I live this outfit! Especially the color of the top and how it goes so well with the white of the skirt. Definitely love it! And you're so welcome, I'm glad to have a blog friend like you too :) Oh and I can't wait for these 7 days! I love how you "created" a peplum top in this outfit! Loving the boat shoes too! I shared this one on my Super Stylish Giveaway Linky, hope you don't mind. Feel free to promote your giveaways there anytime! Yay, Rory's on blogger! :D Haha, I love the new layout and everything. You've definitely figured it out way fast. Anyway, love the pleated skirt too, and the floral tank! Super cute outfit once again. You look lovely! Love your style! You look so pretty, Rory! On another note, I've just changed my domain name. I hope you'll stop by soon! Love the white pleated skirt and the floral top! Perfect for summer!